Recently released documents illustrate just how extensive is the lawless government-telecom cooperation. The documents that were released as part of the criminal prosecution of Joseph Nacchio, the former Qwest CEO who refused to participate in what he believed to be illegal government surveillance programs (and was then prosecuted for insider trading by the Bush administration), are revealing in numerous important respects. Nacchio -- who was convicted earlier this year of insider trading for selling his Qwest shares with insider knowledge that the company was about to lose substantial value -- is attempting to prove that, at the time he sold his shares, he anticipated that Qwest would receive highly lucrative government contracts (for surveillance and other programs) that were being negotiated almost immediately upon Bush's inauguration in 2001 -- months before the 9/11 attacks (the bulk of those projects was ultimately awarded to AT&T, Verizon and others). (1) The cooperation between the various military/intelligence branches of the Federal Government -- particularly the Pentagon and the NSA -- and the private telecommunications corporations is extraordinary and endless. They really are, in every respect, virtually indistinguishable. The Federal Government has its hands dug deeply into the entire ostensibly "private" telecommunications infrastructure and, in return, the nation's telecoms are recipients of enormous amounts of revenues by virtue of turning themselves into branches of the Federal Government. There simply is no separation between these corporations and the military and intelligence agencies of the Federal Government. They meet and plan and agree so frequently, and at such high levels, that they practically form a consortium. Just in Nacchio's limited and redacted disclosures, there are descriptions of numerous pre-9/11 meetings between the largest telecoms and multiple Bush national security officials, including Paul Wolfowitz, Condoleezza Rice, NSA Director Gen. Michael Hayden and counter-terrorism advisor Richard Clarke. The top telecom officials are devoting substantial amounts of their energy to working on highly classified telecom projects with the Bush administration, including projects to develop whole new joint networks and ensure unfettered governmental access to those networks. Before joining the administration as its Director of National Intelligence, Mike McConnell spearheaded the efforts on behalf of telecoms to massively increase the cooperation between the Federal Government and the telecom industry. The private/public distinction here has eroded almost completely. There is no governmental oversight or regulation of these companies. Quite the contrary, they work in secret and in tandem -- as one consortium -- with no oversight at all. 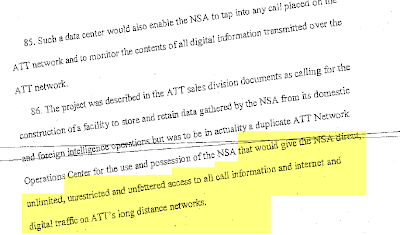 And contrary to the indescribably moronic claim by Fred Hiatt yesterday that telecoms were acting as "patriotic corporate citizens" when they turned over to the Bush administration full access to their customers's calls and other data, the Nacchio documents leave no doubt that these telecoms were viciously competing with one another for the right to cooperate with the Federal Government -- long before 9/11 -- because they were hungry for the multi-billion dollar contracts for this work. There is obviously nothing inherently wrong with corporations competing for lucrative government contracts. But the work they were to perform here -- in providing unfettered data and other information regarding the communications of Americans -- was illegal under multiple federal laws enacted precisely to prohibit telecoms from providing access without warrants to the data and content of their customers's calls. It is a never-ending carousel of multi-billion dollar transactions -- pursuant to which enormous sums of taxpayer money are transferred to these telecoms in exchange for the telecoms serving as obedient divisions of the Government, giving them unfettered access to all of the data and content of the communications of American citizens. That is what is so extraordinary -- and so absolutely appalling -- about the casual advocacy on the part of our nation's "journalists" for Congressional amnesty for telecoms. The amnesty they advocate would result in the complete and permanent dismissal of all of the pending lawsuits arising out of this joint telecom-government lawbreaking, which would, in turn, ensure that this lawbreaking remains concealed. Congress has no intention of investigating any of this, and even if they wanted to -- which they don't -- their subpoenas would simply be ignored and they would do nothing about it. Congress has spent the last six years shutting its eyes towards all of this, except when the White House demanded that it be legalized. These private lawsuits -- brought by heroic privacy and civil liberties groups -- are the only real mechanism left for discovering what the telecoms and our Government have been jointly doing when it comes to spying on our communications, maintaining surveillance data bases of our actions, and violating a whole litany of long-standing federal laws designed to protect the confidentiality of citizens' communications. A law that gives amnesty to telecoms would mean that those lawsuits are stopped in their tracks, and we would likely never find out -- at least not for a long, long time -- the extent of this oversight-less surveillance by our government on Americans, nor would we be able to obtain a judicial ruling as to its illegality. What kind of an American -- let alone a "journalist" -- would think it was a good idea to remain ignorant and in the dark about what our Government is doing when it comes to spying on its own citizens? That desire -- that urge -- to help the Government conceal even its likely illegal acts is the very antithesis of the most elementary instinct of healthy, authentic "journalism." Yet our nation's most influential and rewarded journalists -- the Fred Hiatts and David Ignatitus and Joe Kleins -- have long ago ceased to be "journalists" in any meaningful sense. They have no interest, no desire to uncover anything. Their goal is the opposite -- to aid and advocate government secrecy, to defend and justify the government's operating in the dark, to block efforts to disclose and shed light on what it is doing. These are the questions that are likely to be examined and explored in the pending lawsuits against AT&T, Verizon and other telecoms. And these are the issues that will be suppressed and concealed if the White House, their telecom partners, their bought-and-paid-for Senators (such as Jay Rockefeller), their bipartisan constellation of lobbyists and advisors (William Barr, Jamie Gorelick, Dan Coasts, Charles Black), and their media enablers (Hiatt, Ignatius, Klein) have their way and Congress bestows onto these corporations amnesty for their lawbreaking. This behavior -- having telecoms secretly turn over to the Federal Government all information about the communications of Americans -- is exactly what multiple federal laws were designed to prevent. We criminalized exactly that behavior through the laws we enacted. And now that it is revealed that the Federal government and many (though not all) telecoms continuously broke those laws -- motivated by profit in the case of telecoms and by a desire for unchecked surveillance power in the case of the Bush administration -- our political establishment and Congress are working hand-in-hand to prevent any further disclosures of this lawbreaking and to forever prevent any accountability for it. Merely to describe this behavior is to demonstrate its profound corruption and threat to the very concept of an open democratic government operating under the "rule of law." UPDATE: As always, the Bush administration and their allies intend to play games with and nakedly exploit national security issues in order to obtain more unchecked power. Specifically, Roll Call reports today (sub. rq'd) that "Republicans are planning to use the kidnapping and subsequent murder of three U.S. soldiers in Iraq earlier this year to put a 'human face' on the [FISA] issue" -- referring to prior claims by Mike McConnell that delays in completing the forms for a FISA warrant prevented timely eavesdropping on Iraqi insurgents who had kidnapped those soldiers. Like clockwork, the standard roster of GOP hacks -- The New York Post and Instapundit -- have their talking-point marching orders and are today promoting this dramatic tale. The Post article goes so far as to show a picture of one of the kidnapped soliders with his wife and repeatedly insinuates that the need to comply with FISA prevented the U.S. military from eavesdropping on insurgent calls and thereby prevented the military from saving this soldier. As Spencer Ackerman previously reported, McConnell's claims in this regard are completely false, since their failure to eavesdrop right away was their own fault for failing to invoke FISA's emergency eavesdropping provision, whereby they are free to eavesdrop for 72 hours without a warrant. Just as importantly, the eavesdropping here involved foreign-to-foreign communications (i.e., Iraq-to-Iraq), which nobody in Congress believes ought to require a warrant. This incident, then, has absolutely nothing to do with the pending FISA debate. But the administration and its standard, mindless followers nonetheless exploit -- as usual -- the U.S. troops who were killed by insurgents in Iraq for their own domestic political agenda. UPDATE II: Over at FDL, Christy Hardin Smith has detailed information about the current status of the various FISA bills in the House and Senate. UPDATE III: Here is a superb example of how Fox News just outright lies to its viewers. The story, narrated by Jim Angle, dramatizes the above-referenced delay in eavesdropping on the Iraqi insurgents who had kidnapped U.S. soldiers -- a delay created by the administration's failure to obtain quickly the necessary authorizations for emergency warrantless eavesdropping. Angle then reported, accurately, that the August FISA bill passed by Congress eliminated the need for warrants in such cases -- i.e., foreign-to-foreign communications which are routed through the U.S. network (through fiber optics). But Angle went on to say that "some don't like the new law, including [Democratic] House Intelligence Chairman [Silvestre] Reyes." Angle also said that "critics argue that bill goes too far and have pledged to roll it back." He thus repeatedly implied that if "critics" of the law had their way, warrants would be required even for eavesdropping on foreign-to-foreign communications of this sort highlighted in his story. But that is just an outright falsehood. Nobody in Congress -- including Rep. Reyes -- opposes fixing FISA to clarify that no warrant is required for foreign-to-foreign calls (just as was the case for the original 1978 FISA). The only thing "critics" want to change from the August travesty is the provision that allows warrantless eavesdropping on international calls involving U.S. persons in the United States -- which have nothing to do with the calls Angle is talking about. This is why people who get their news primarily from Fox will inevitably be misled about most issues and, far more significantly, why reporters who recite GOP talking points on these issues equally mislead their own readers and viewers. UPDATE IV: Some mild credit is due Rep. Reyes for issuing a fairly strong statement condemning what he called the "cynical and transparent attempt to use the lives of American servicemembers for partisan political gain," whereby "Republican operatives are once again hawking the now-debunked story that the Foreign Intelligence Surveillance Act caused a delay in surveillance intended to help locate missing soldiers from the 10th Mountain Division in Iraq." Reyes explains that even the House FISA bill makes clear that (consistent with the original FISA) no warrants are required for foreign-foreign communications, and in any event, any delay in that particular case is the fault of the Bush administration for failing to comply with the law, not with FISA. They really are just blatantly exploiting these dead soliders to "justify" vast new warrantless eavesdropping powers, even though the incident they are exploiting has nothing to do with the powers they are demanding.